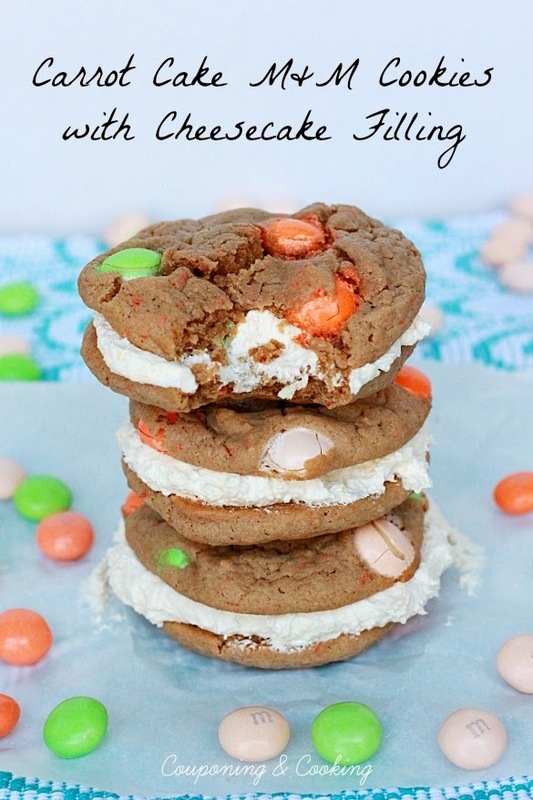 Sweet and spicy cookies with carrot cake M&M's filled with a whipped cheesecake filling! I love almost all desserts with the exception of a few specific things. I have a couple of major dessert pet peeves. Things that get me every time. So here they are in no specific order. Dessert Pet Peeve #1: Fruit hidden in chocolate cakes: my grandparents' Beach Club always serves this gorgeous, rich, flour less looking chocolate cake at Easter brunch each year. And every year, without fail, I reach for that cake only to get back to my table to find that it has raspberry in between every layer. I am not completely against fruit and chocolate; just don't blindside me when I think I am getting a bite of pure chocolate cake. Dessert Pet Peeve #2: Whipped topping instead of buttercream icing/frosting: Why do people and bakeries do this? It's a trick and I fall for it every time. It's to the point where I ask people before I cut a piece of cake or grab a cupcake, "Is that whipped topping or real frosting?" People who know me have gotten use to it and started to pre-warn me. Moral of the story is: whipped topping has a place in the dessert world and on top of cupcakes isn't it. Dessert Pet Peeve #3: Raisins don't belong in cookies. I know I am going to get some flack for this one but raisins are chocolate chips are not interchangeable. They don't belong in cookies. It's an unforgivable deception. Personally, I think the only dessert raisins actually belong in might be bread pudding. Go ahead and judge me. Dessert Pet Peeve #4: If it has a vegetable in it, it's not a cake. And that includes carrot cake. Pretty much the only reason I even attempt to eat carrot cake is for the cream cheese icing. I don't hate all carrot cakes but usually it would be one of the last things I go for on a dessert table. 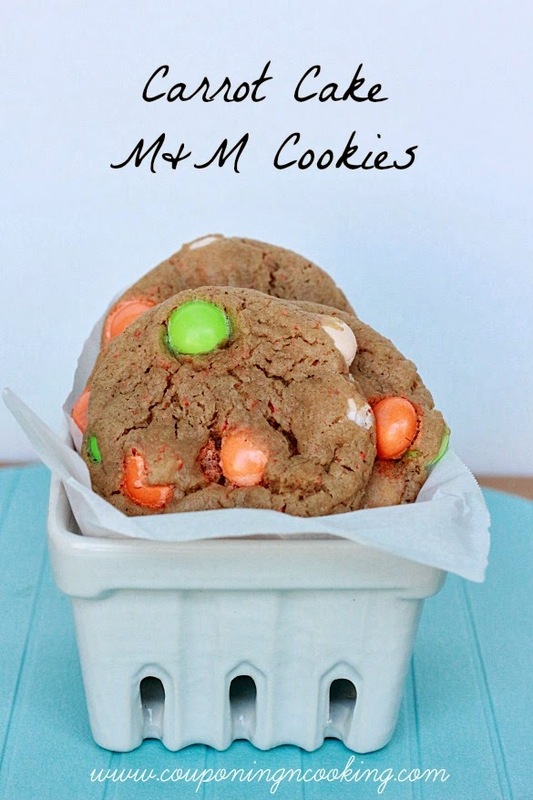 But I have to admit, I am in love with these Carrot Cake M&M Cookies. Like they might be the best thing I have made in weeks (and that says a lot for me). They are good all on their own but when you spread Cheesecake Filling in between two of them they are heavenly. 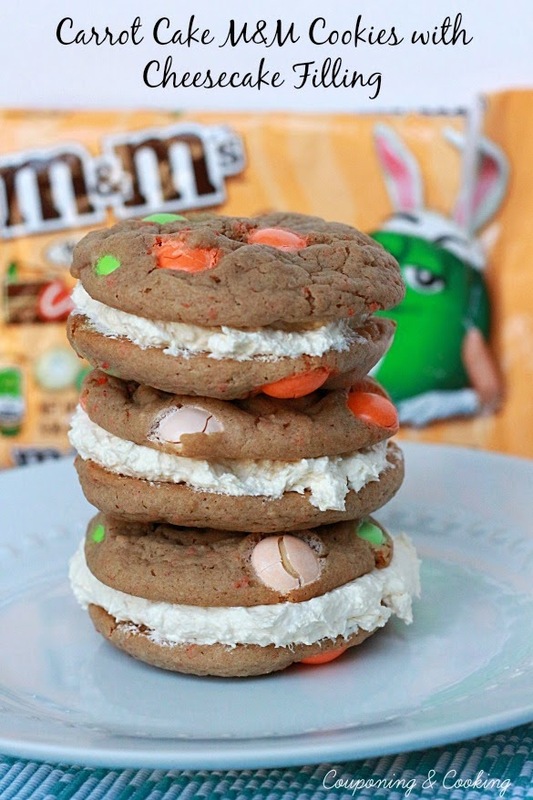 These were inspired by a trip to Walmart where I stumbled upon White Chocolate Carrot Cake M&M's. 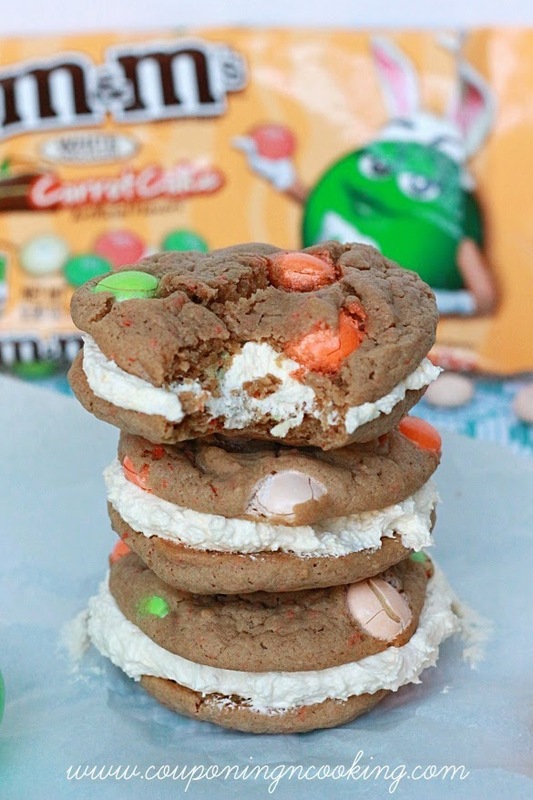 I was already planning on making a carrot cake version of my Easter M&M Cake Mix Cookie Sandwiches from last year and these M&M's were the push I needed to take them over the edge. They are so good I think that they might have cured my carrot cake phobia for good. Just what the doctor ordered. 1.) Mix together the cake mix, eggs, baking powder, and oil until completely combined. 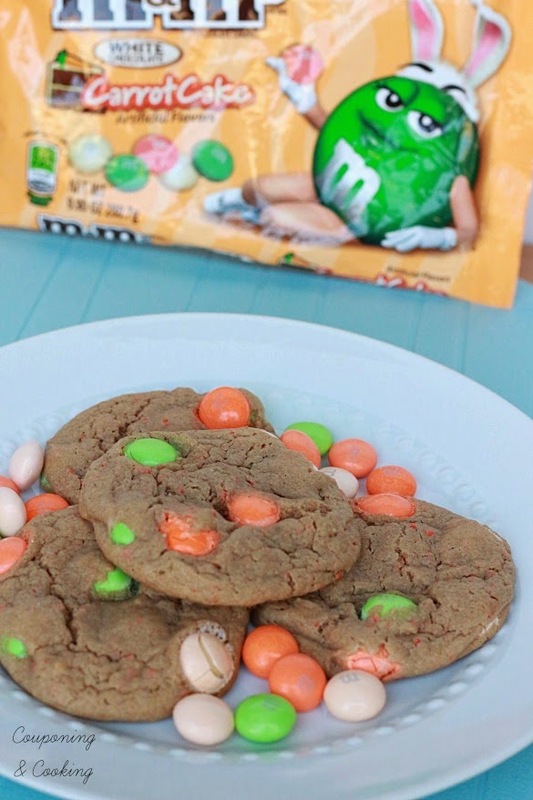 Stir in M&M's. 2.) Using a cookie scoop, place rounded scoops of dough on a lined cookie sheet and bake at 350 degrees for 10 minutes. 3.) Let cookies cool completely. 4.) While cookies are cooling, stir the cheesecake pudding mix into the tub of Cool Whip and mix completely. 5.) 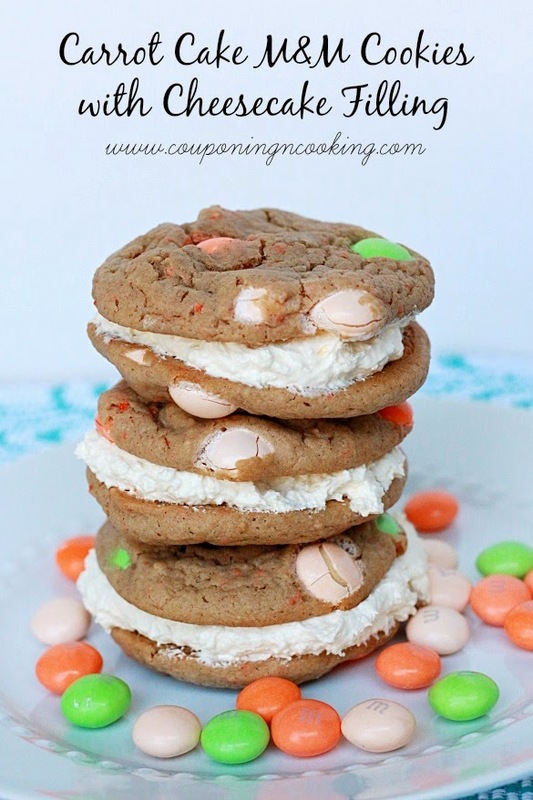 Spread a generous amount of the Cool Whip filling in between two cookies, sandwich together and enjoy! 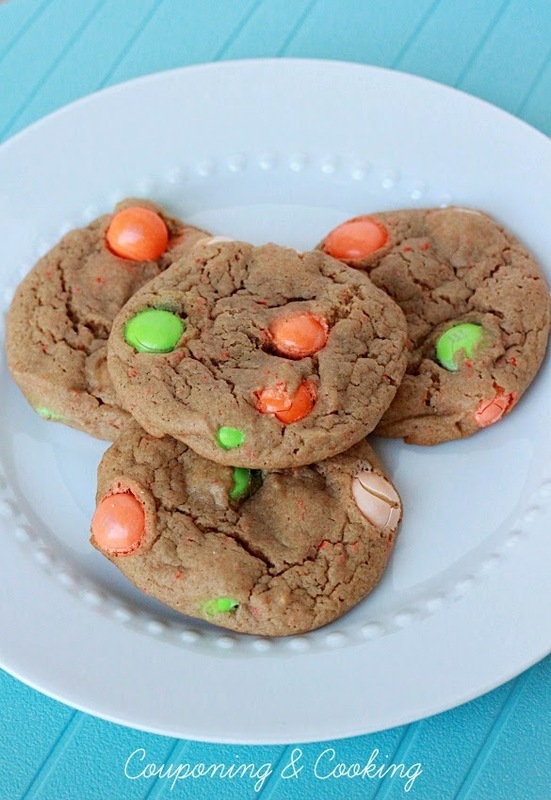 Make sure to keep any cookies with filling in them in the fridge.